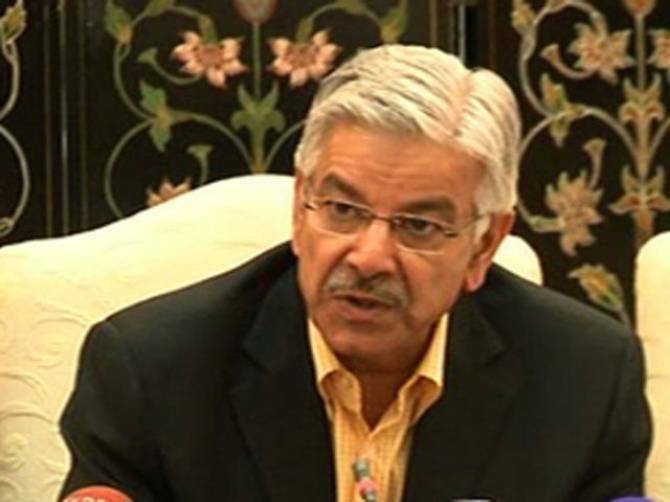 ISLAMABAD (92 News) – Defence Minister Khawaja Asif has said that the Indian government is creating the environment of a war and Pakistan is being presented as a villain. In a statement on Tuesday, he said that Pakistan will present the proofs of Indian terrorism in the UN General Assembly session. “We will not withdraw from the Kashmir issue,” he said. The minister said that they are displaying patience despite tension. “India is backtracking from the Ufa agreement,” he said. Criticizing the PTI and Imran Khan, Kh Asif said that Imran Khan is depressed due to his frenzied situation. “The sit-in threat can do nothing. No one can blackmail the government,” he added. He alleged that investment is being made abroad through the donations of Shaukat Khanum Hospital.